I’m exited to announce my second eBook release. Out of Reach, like Blind Run, was originally published by Ballantine Books in hardcover, then a year later, it came out in paperback. 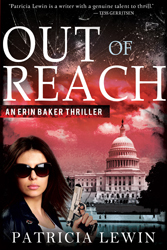 Unlike Blind Run, however, Out of Reach is the start of my Erin Baker Thriller series. I absolutely love the main character, Erin. Heck, I’d like to be Erin. Enjoy! In her acclaimed novel, Blind Run, Patricia Lewin proved her brilliant command of heart-stopping tales of suspense—and the staggering human emotions that go with them. Now in Out of Reach, Patricia Lewin returns with a gripping new thriller—a gritty and terrifying story of a man and a woman entering a battle against an unseen evil . . . the kind that targets the most innocent among us. CIA Officer, Erin Baker, is driven by a tragedy from her past. When she was a child, her eight-year-old sister, Claire, was kidnapped. Erin blames herself, and although Claire was eventually found, she was changed forever—as was Erin, who’s since spent her life defending those unable to protect themselves. Once a covert officer overseas, Erin now works in D.C., still gathering information for the most powerful intelligence agency in the world. But her life takes an unexpected turn when a child disappears near her home, and Erin becomes convinced there is a link to her sister’s kidnapping case. She meets Alex Donovan, an FBI agent with an outstanding reputation for locating missing children, who’s charged with finding the missing boy. Suddenly Alex and Erin find themselves embroiled in a horrifying underworld where children are stolen and trafficked. And as they get closer to the truth, they and everyone they love become targets for a killer. With its deeply-drawn characters, relentless pace, and powerful depiction of human courage in the face of danger, Out of Reach is a gritty, terrifying novel of a nerve-wracking race against time. With echoes of today’s most shocking headlines, this is fiction at its most passionate and suspenseful. This entry was posted in Book Release, Books, News, Patricia Lewin Book and tagged CIA, FBI, suspense, thriller. Bookmark the permalink.